I’ve already confessed to man-crushes on Chris Christie, Marco Rubio, Rand Paul, Ron Johnson, and (or course) the Gipper, but it’s time for me to cross partisan and racial boundaries and announce my man-crush on Cory Booker. From the Huffington Post, here’s what the Newark Mayor had to say about the failed War on Drugs. Newark, N.J. Mayor Cory Booker took to Reddit Sunday to criticize the war on drugs, saying it was ineffective and “represents big overgrown government at its worst.” “The so-called War on Drugs has not succeeded in making significant reductions in drug use, drug arrests or violence,” the Democrat wrote during the Reddit “ask me anything” chat. “We are pouring huge amounts of our public resources into this current effort that are bleeding our public treasury and unnecessarily undermining human potential.” Booker then called drug arrests a “game.” “My police in Newark are involved in an almost ridiculous game of arresting the same people over and over again and when you talk to these men they have little belief that there is help or hope for them to break out of this cycle,” he wrote. At the risk of stating the obvious, this doesn’t mean that anyone should use drugs. I’ve led a very boring life, for instance, and have never tried any illegal drugs. But Mayor Booker is right. Like Ron Paul, Pat Robertson, Richard Branson, and Gary Johnson, he’s figured out that the Drug War is mostly a vehicle to expand the size and power of government. It’s why we have fascist asset forfeiture laws and costly money laundering laws. Oh, and by the way, the Drug War has totally failed in stopping illegal drug use. Though it has enriched organized crime, so big government isn’t the only beneficiary. To learn more about the failed War on Drugs, I’d recommend this video and this video. But mostly, I suggest you read these two horrific stories. P.S. As you can see from this post, there actually are political jokes about money laundering laws. I haven’t run across any about the Drug War, but I’ll be sure to post them if they show up in my inbox. P.P.S. Here’s a very funny video featuring Cory Booker and Chris Christie. Kudos to both of them for having senses of humor. 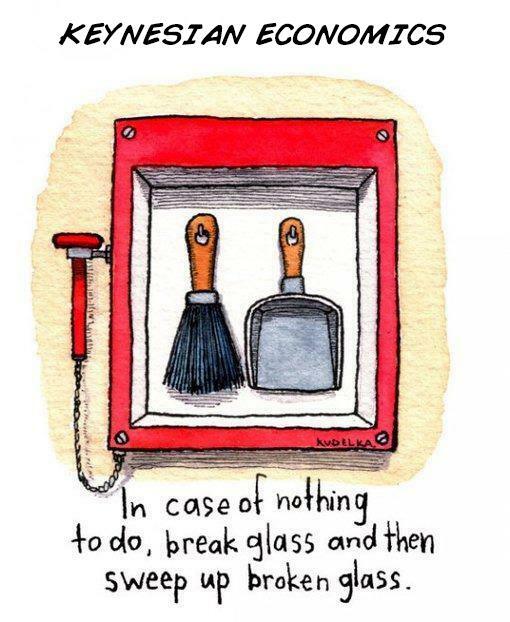 I’ve run across very few good cartoons about Keynesian economics. If my aging memory is correct, I’ve only posted two of them. But at least they’re both very good. We have one involving Obama, sharks, and a lifeboat, and another one involving an overburdened jockey. Now we have a third cartoon to add to the collection. To provide a bit of additional background, the cartoon is channeling Bastiat’s broken-window insight that make-work projects don’t create prosperity, as explained in this short video narrated by Tom Palmer. I make similar points in this post mocking Krugman’s wish for an alien invasion and this post explaining why Obama’s green energy programs lead to net job destruction. P.S. This Wizard of Id parody is the best cartoon about economics, but it teaches about labor markets rather than Keynesianism.